Showing up for this Operation Rescue is an indication of having seen the undeserved relief of misery that we ourselves need. In Christ, we have been “declared righteous” but not yet been “made righteous”. So our best option is to continue to long and yearn for ways better than our own natural inclinations. Relieving the misery of those who harm is not our first instinct. Showing to others what we, ourselves, never stop needing is evidence of the work in progress— of Christ in us (Matt 5:7) (Eph 4:32-5:1). An old adage and one that bears fruit in this life and in the next. I believe the word is “reciprocity”. “Dear friends, we are already God’s children, but he has not yet shown us what we will be like when Christ appears. But we do know that we will be like him, for we will see him as he really is.” (1 John 3:2) Good News Bible translation is quoted above. This resonates truly for me at this point in my walk with Jesus. Day by day we hope to show forth Jesus’ presence in us, trusting the Holy Spirit to bring in the kingdom. It does not always work out that we share the unfathomable mercy of the Lord. It seems to me I enter a place beyond my comfort when I hold to Jesus’ standard. In these days of grace it is my privilege to confess, repent and move on in hope and trust. Do we ask God to carry us through the storms of life? Then we must carry others through the storms of their lives. Are we tired of the onslaught of life? Then we must give rest to those who are weakened by it. Do we offer criticism or comfort; a silent shoulder or a slap on the back of the head? Are we patient with others? Or are we disgusted with their lack of progress? Do we ignore their poverty or give from what we have, gladly? Whatever it is you expect from God, ask for it and while you wait for His rescue take care of all those you can with the abundance He has already provided you with. As I have repeatedly stated time and time again, there is no end to doing what is right nor growing toward the likeness of Jesus. It is a life long progression that ends only with either His return or the grave. Like marriage our commitment to Jesus is meant for live. I like the last word of Steve’s post.Marriage is a life commitment but based on Jesus teachings it and the Christian Way should be a live commitment in God’s Spirit. When I first knew I wanted to work with people who had been abused, as I had, the very first thing our Lord told me was that I had to learn to love, not just forgive, but to love my abuser. Years later working in the mental health field with many victims and abusers, I saw the need for Christ and all he stands for in the lives of abusers, who themselves had been victims at one time. One of the greatest rewards of my life’s work has been seeing victim-abusers receive the grace of forgiveness and freedom from their past failures. A work in progress starts from the very beginning, where we all have sinned and fallen short of the glory of God. “There but for the grace of God go I”. It seems like a repeated requirement that the Lord asks of us is to show mercy. Hosea 6:6 NIV; Micah 6:8 NIV; Matt 9:13 NIV. It was undeserved for me so how can I not show it to others. I may not have done the same offensive but I have offended and it is God who I have sinned against primarily which in turn harms others but yet I was shown grace and mercy. Unbelievable isn’t it? Steve, you’ve made a great point… I trust there is also a place left between the extremes of,”Do we offer criticism or comfort; a silent shoulder or a slap on the back of the head? I would say we have more to offer than be silent, or comforting by tell a little comforting white lie, we can also offer truth. But. to further my point, how it will be recieved whether as a slap on the head, or something given in an effort to show that there is another way other than silence may be beyond our control even if Love is the root of always sharing truth. Although, to your point, I do remember a George Carlin skit where he walked out on stage and said nothing just remained there silent for the entire time, and the expectant crowd was roaring with uncontrolabe laughter when he existed stage right at the end of his performance. There is another old adage that says, there is a time for everything. Even a time for sharing truth, even truth that does not comfort but exposes, uncvovers, and produces a reality that is not currently seen, or purposely now looks the other way in avoidance. Now, I perfere that kind of spoken truth, rather tnan a blank and silent sign any day. Sorry my way of expression is many times so tough to hear, it comes either naturally or by a gifting, and like passing on the truth, only the recipient makes that judgment for themselves. our Christian position, let us each today pray for those in over twenty countries in the world today who are currently pursecuting our Brothers and Sisters in Christ. May the rest of the world not remain comfortably silent to this truth. Please do not think I am not about waiting on the Lord. He is ultimately in control of all things, thank God! Or am I just speaking to hear my own voice,or looking down on others thinking myself in a higher position, as in being pridefilled. But, I beleive it was the silent church, that by not speaking up to the whole world immediately and loudly, that allowed that evil in the German concentration camps to go on far to long, were they not looking the other way. Were they waiting on God, or silenced by something else? Who lights a lamp and puts it under a bowl? Why would one hide the light… or silence the truth? Are we not to put it on a lampstand and let it fill the whole house? Why are we not to be bridled to an unbeliever? Can the two walk together each in their way and not stumble the other? Can truth and silence be married and fruitful? Sorry, if I’m out of context, or seemingly slapping others. Consider all this as a loving touch of reality. Is being “declared righteous” but not yet been “made righteous” kind of like being “declared forgiven”, but not yet being forgiven? Artle, does not righteous mean without sin or guilt. So then one would not need forgiveness so until we leave this body we will not be “made righteous” but we will be forgiven. Gary, how is what you said being an example of showing mercy to receive mercy? So if it is truth then slapping others means you want to be slapped which does not seem to be a reflection of Christ (Eph 5:1 NIV). Jesus showed us mercy when we deserved to be slapped but even Jesus did not chose to slap but to die to show us God’s great mercy towards us. Artle… this is a very “touchy-feely” subject for some. It is like knowing you are saved from your sins and their punishment which is certainly death, but not quite yet, because yet you are still sinning and still living and dying because of sin itself. Without sin mankind was born to live forever, according to the Garden story I heard. Unless, you’ve grown to believe you are already forgiven them, then you are just living in them anyhow and dying from something else. It seems to me, we are told the reality is somewhere in the confused muddle of the middle, as being different strokes for different folks, or just believe what you are led to believe with the faith you now have. Kind of like this modern version saying, all roads will lead all people to this forgiveness, because Christ died for all. Why get bogged down with any restrictions placed upon your thinking, or with any rules and regulations? Just live and let live, or love and let love. No laws to be obeyed, no protocols to be met. Perhaps this is slap to those who do not yet know Him. Sometimes a slap is given to the still born and not yet breathing on their own, just to bring about life! Perhaps some here think that the Dr’s should let them stay comfortably asleep. I’d welcome the slap any day. Point was if God declares something, what more is there to it? The answer would be nothing. It is a finer point, but an important one and worth noting because we all too often add provisos to His plan, replacing the gift of Grace with our own ideas; in this case, we must somehow become righteous. There are no requirements beyond belief either before or after the belief comes to exist. Righteousness is actually a result of faith and not something earned by being right or good or anything else. You have faith therefore you are right with God, but only because of His Grace shed on us thru Christ Jesus. pooh… I said quite a few things so I am not sure to which things you are calling me to account. I trust it was not my asking us all to pray though. Gary, you are correct it was not about asking us to pray. quietgrace – wonderful comment, what courage to share that. I agree it would be rewarding to see an abuser or some other soul who carries the weight of a grievous sin receive forgiveness and grace. It is the proof that we have a God who can work miracles and saves us with His love instead of the punishment we deserve. As Mart said, “Relieving the misery of those who harm is not our first instinct. Showing to others what we, ourselves, never stop needing is evidence of the work in progress— of Christ in us (Matt 5:7) (Eph 4:32-5:1). Showing to others what we, ourselves, never stop needing… SO TRUE! Suppose you know something that others don’t, concerning God? Suppose you try to tell them, but they won’t listen? Suppose it is that God will forgive them even if they don’t deserve it, according to their or your standards? When and if you bring the message, you and your message is rejected out right and you yourself ridiculed for just being the messenger. In your heart if you ask for forgiveness/mercy for those who rejected your message and you for delivering it, would you not be acting on the council of Jesus when He said “blessed are the merciful for they shall obtain mercy.”? Hanging on the cross Jesus continued to teach and lead by example. His words “Eloi, Eloi, lama sabachthani” are not a declaration of God abandoning Jesus, but rather are Jesus’ way of showing those around the cross to look to Psalms 22:1-31 in order to begin to understand what is going on. Interesting that Psalms 22:26 the meek are once again showcased. Luke 23:34 Jesus again echo’s the ideals of showing mercy in order for us to obtain mercy. Maru, the gardeners around here take all the things that are left in the Garden at the end of the growing season and make a relish locally called “Piccalilli”, especially the green tomatoes are an integral part of the garnish. I especially enjoy fried green tomatoes, and it almost could be said prefer them to the riper one; though I also enjoy a ripe tomato in salads and on a BLT. Our growing season has been over for some time now, this morning it was 25 and we have already had near 4 inches of snow. The concept of frost on the pumpkin is alive and well here. My uncle that used to live in Eureka CA. liked to brag about having fresh strawberries in February, I don’t know maybe his way of tormenting us, knowing we still have feet of snow on the ground at that time. We had our first frost in the Willamette/Tualatin Valley last night (31-33 deg). In higher elevations, like yours, we already have snow and 20 deg. Yes, the kale and collards get sweeter, along with the persimmons about this time. Trusting you, Matt and Glenna are snug in your mountain home. Soon, we will have more rain than we know what to do with! Rarely snow in the Pacific coastal basin. Green tomato salsa is a big favorite over this way — with chopped Anaheim or Hatch green chiles — all on a crispy fried corn tortilla piled with meat, cheese and chopped onions. I have great memories of sliced green tomatoes — dipped in beaten egg — rolled in corn meal and fried. Mmmm! Best stir around over here and get some breakfast! To ripen green tomatoes we used to wrap them individually in newspaper and store them in a cool spot, for us it was the cellar. It seems the gas they naturally give off ripens them more quickly that way. We just didn’t do green tomatoes back then. Gary we used to have a winter pear tree that we would pick about the first frost and wrap them in newspaper to ripen through the winter. Also wrapping them individually kept them from getting rotten spots from touching each other. If you picked the pear off the tree before the first frost you could pull a tooth trying to bite into them and they had a hide like a rhino. But in the dark cellar all wrapped up in the paper they would soften up nicely and be a nice treat through the winter. My dad and I always made cider every late September or early October, we would get a pickup truck load of apples from the old orchards that remained from the old farms in the area and use an old cider mill to grind up the apples and squeeze them into fresh cider. Of course the bees would be everywhere and some get squeezed in with the cider as well. The cider would go into gallon jugs and stone crocks and rest in the cellar also as throughout the winter you could always go and get a cool cup of cider from the crock, after you scooped off the mold growing on top. Though we always drank as we made it, one really should not drink fresh cider as it will go through you like a line drive. All of that memory just from you mentioning wrapping green tomatoes up to ripen them. Now if someone could just figure a way to keep bananas other then banana bread they could be on to something big. For bananas the best thing to do to extend or slowdown their ripening process is to separate them right away, that way they do not gas each other so quickly. Also cutting them up into bite size pieces and freezing them in plastic bags for smoothies or other purposes really works best and they break apart quite easily when needed. PS Get the smaller ones because you are really paying for the weight of the peels. That’s about all I’ve got to sdd about bananas. A signature mark of a work in progress, is progress. Progress can be stalled or stagnate if the basics of the “Signature Mark” have yet to be learned, understood and then practiced resulting in the mold growing and the fruit rotting which turns it into a useless commodity that will be tossed out having no worth. What is the purpose of the “Sermon on the Mount” if not to instruct us how to live with others, in the light of the nature of God? Jesus says in John 10:10 that He gives us life to live abundantly. An abundant life is seen explained in the Beatitudes. We are born babies and so grow into adults learning how to become adults; we are not born already spiritually perfect and so must also learn how to become adult in our spirits as well. We live amongst other people and it is living amongst others that the problems exist in *not* demonstrating the adult spirit and nature of God in our actions. So as we go about our daily walk and interact with others what we show is these attributes given from Jesus as how to *live*, and not just live, but live an abundant life among other people. This doesn’t mean we constantly preach to people or attempt to shame or bully them into accepting God on our terms; no we demonstrate God by our actions, friendliness, and kindness and in all that we say and do. We are also warned not to *quench* the Spirit. Nothing is as disruptive as stopping the warm and social comfort and comrade amongst people as stopping the flow of friendly conversation then by throwing cold water on it. And nothing so counter to the nature of God as saying it necessary because the conversation not about God. We can read and understand every Word of Scripture, but if we don’t adopt the nature of what is taught into our own nature then it is all for nothing. Seems a long, dusty road I have traveled to bear any resemblance to the Lord Jesus! The mark of mercy is not easy for anybody seeking to follow Him. It seems to me, we may look up and rejoice when we can behave mercifully toward the pesky tomatoes that are still green when a hard freeze is forecast, or when there are bees floating in the cider! In my mind’s eye, I can see Jesus pulling up the tomatoes to bring them into the barn to hang upside down. He would also patiently pour the cider through a mesh to strain out the bees (and who knows what else). Following Jesus, it seems to me, is messy — not clear cut and neatly discerned. Catching up & reading the comments with interest. My two cents on ripening green tomatoes. 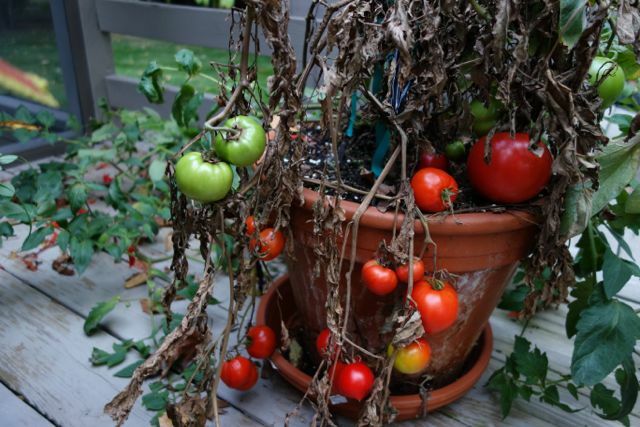 From my experience (& being told by my husband’s grandmother, years ago), if the tomatoes are very dark green, when picked, they may not ripen at all. Those would be good for frying or relish. If they are light green (whitish), while still on the plant, they are getting ready to ‘turn’ and optimal for ripening ‘off the vine’ then. Tomatoes ripen in the dark; therefore, light is not required & actually can be detrimental. On a windowsill, where the intensity of the sun is somewhat magnified by the glass, it tends to make the skins of the fruits tougher & overheating the tomatoes can cause them to rot. Healthwise, all the preliminaries are finished now & I am just waiting to hear if insurance will cover the focused beam radiation treatments I need to treat the offending tumor &, if so, when the treatments will begin. I will need five of them. Thank you, all, for previous words of encouragement & your prayers. It means a lot to me. BTA is a wonderful family! Hoping and praying the insurance coverage will extend to the radiation. It will be so much more comfortable to know it is taken care of. The way I understand it none deserve mercy or it would not be mercy. None of us no matter how good we think we are deserve God’s mercy. I guess that is why it is the signature mark that shows we are a work in progress. If we are able to grasp anything at all about God and us it would be mercy and when we fully understand how amazing it is we will go to any lengths with the help of God to show it to others because we are so grateful for it in our own lives. Cheryl, praying for the insurance to cover your procedure and for a wonderful outcome. Steve, what did you mean when you said, “Nothing is as disruptive as stopping the warm and social comfort and comrade amongst people as stopping the flow of friendly conversation then by throwing cold water on it.”? Where you speaking about how the conversation turned form mercy to tomatoes and apples?? Steve, what did you mean when you said, “Nothing is as disruptive as stopping the warm and social comfort and comrade amongst people as stopping the flow of friendly conversation then by throwing cold water on it.”? Were you speaking about how the conversation turned from mercy to tomatoes and apples?? To me, a true signature mark of a work in progress even in those we may label as not yet as learned and practiced as we “more mature” beleivers are, is really not very well founded but all a wash if one is found Asking, Seeking, and Knocking, or possessing any thirst and hunger as being not yet satisfied, and still searching. Like any true disciple, being a lifelong learner, and under disciple. If there is any real sign of a stalled, stagnant, moldy and rotting presence anywhere, it may perhaps be found in one who is still living in disobedience and with unbelief about exhibiting any real change, or fruit. Living like a sugestive looking but unproductive fig tree if you will having only a false type of faith, one with no works… or living as having only a useless and dead faith. Gary, would one really be a “mature believer” that has never come to the end of their self to see their need to search after their Savior with all that they are? If they really see a need that only the Savior can satisfy would they be living in disobedience or would they desire with all their heart to please the Lord because of all that He has done for them? Being connected to the Vine that gives the ability to live in obedience and one of the very important steps in that obedience is to show mercy just like we have received. We will be blessed to give away what we have received according to that verse. We can not earn mercy by being obedient, we were given the gift of mercy because we were disobedient. What do we do with that gift put it on the back burner getting moldy, stagnant, rotten because of a lack of use while we point out sins in others? Or do we give it out as freely as it was given to us which shows Christ in us giving an ongoing, progressive evidence of our faith? What verse are you speaking about? Could it be the one Mart has cited, the one that has a certain condition which progressively qualifies it? Very true, the verse does not say we earn mercy by being obedient, unless of course, we recognize that being merciful is also being obedient. Nor does this verse say, that mercy is granted as a gift only to those who were disobedient either. I know it is all the same thing using different words, where you may call it a B flat, I may say it is an A sharp, but, it is really the same note. We just prefere to play it differently because we each seem to read the music our own way. Faith, love, grace, mercy, forgiveness, righteouness, are all the notes we play with to make the cords we play to produce the music, the fruit of the Spirit, the evidence that produces the works of faith. We just use different instruments, or giftings given to us for the greater purpose of all things working together to bring about good, we just sometimes choose to use different words. The following verses talk about the fact that each of us are particularly gifted in special areas not to the exclusion of the other gifts. Romans 12:6 Since we have gifts that differ according to the grace given to us, each of us is to exercise them accordingly: if prophecy, [a]according to the proportion of his faith; 7 if [b]service, in his serving; or he who teaches, in his teaching; 8 or he who exhorts, in his exhortation; he who gives, with [c]liberality; he who [d]leads, with diligence; he who shows mercy, with cheerfulness. 9 Let love be without hypocrisy. Abhor what is evil; cling to what is good. 10 Be devoted to one another in brotherly love; [e]give preference to one another in honor; 11 not lagging behind in diligence, fervent in spirit, serving the Lord; 12 rejoicing in hope, persevering in tribulation, devoted to prayer, 13 contributing to the needs of the [f]saints, [g]practicing hospitality. In my experience, the bringing of the kingdom of heaven is the kindness Messiah performs — a symphony composed by our God, whom we trust. We thirst for it and hunger for it. We sing in harmony with the chords of love, while Jesus composes the melody that transforms all things. The natural mind and heart only receive the mercy of God. We learn the melody, while the Lord breathes all grace into being. No business is transacted in worshiping God, it seems to me. The choice is God’s to make us his instrument. From this mornings “My Utmost fo His Highest”. Faith by its very nature must be tested and tried. And the real trial of faith is not that we find it difficult to trust God, but that God’s character must be proven as trustworthy in our own minds. Faith being worked out into reality must experience times of unbroken isolation. Never confuse the trial of faith with the ordinary discipline of life, because a great deal of what we call the trial of faith is the inevitable result of being alive. Faith, as the Bible teaches it, is faith in God coming against everything that contradicts Him— a faith that says, “I will remain true to God’s character whatever He may do.” The highest and the greatest expression of faith in the whole Bible is— “Though He slay me, yet will I trust Him” (Job 13:15). “If there is a progression in Jesus’ Declaration of a New Day”, then how many people are eager to get to Matt 10,11 NASB? I guess one could look at showing/giving mercy as a form of obedience but then would it really be from the heart or just another way to get applause for the performance? If it is given from the heart out of gratefulness realizing that I have received such a wonderful gift and want to share, I do not think of it as being obedient. More like paying it forward. Matt 18:21-35 NIV with emphasis on Matt 18:33 NIV. thinking that the gift is as an instrument with its own form of music for that particular gift/instrument and that is why we all can’t read the music in the same way, or play it the same way. That may be prophetic in nature, but only if it is the prophetic nature given to me as a gift. Anyhow as Maru has said,”In my experience, the bringing of the kingdom of heaven is the kindness Messiah performs — a symphony composed by our God, whom we trust. We thirst for it and hunger for it. We sing in harmony with the chords of love, while Jesus composes the melody that transforms all things. All gifts/instruments contibuting to the greater symphony of life, and of God who gives all this life. Considering we are made for His pleasure, in His image, and to bring Him, glory, honor, and praise. Gary, before you stated that you felt it was your gift to point out the failures/sin in others. I do not think that is reading the same music that is intended for all God’s children as is showing mercy. Or have you changed your tune? pooh… you are correct, although your words may not be my actual words, but, that is my job/calling/gift to discern wrong teaching and beliefs where ever they appear to exist in the churched community today who now call themselves Christian, but also still fit so well into this world and all its trappings. So, pointing out any lack of obedience or what I call disobedience/sin which plays so well into todays wrong or falsely held beliefs or teachings that say only faith without “any” condition or any works is all that is ever required. But we have covered that ground since day one, and I can no longer pursue that because it will not be tolerated any longer. Just as Paul taught, false teachers have slipped in among us and teach what itching ears want to hear, because we all know there will come a time when sound doctrine will no longer be tolerated. Paul believed in Matthew 10:21,22. But, today there can not be anything even perseverence ever related to salvation, because that would be deemed as some form of required work or obedience on our part, or a condition which does not work well within todays popular teachings where it must be all God. So, we could say that at least having aelationship with Christ is a condition that must exist, but that probably won’t play today either. My tune has not changed, we each must play a part in the picture of salvation. I wonder if anyone on this blog has the “Gift” of mercy? Surely there has to be at least one. Gary, I guess I have never understood that as a spiritual gift as we have talked about in the past but what do I know. I never give up hope over these many years that the tune will change. In response to cbrown on whether anyone on this blog has the Gift of Mercy – only God may know the answer to that. Outside of the blog, in my opinion, it seems that Mother Theresa may have had the Gift of Mercy. Cherielyn, I am praying for you as well.